A biological plague begins infecting artificial intelligence; a natural-born Earth woman seeking asylum on another planet finds a human society far different from her own; a food blogger’s posts chronicle a nationwide medical outbreak; trapped in a matchmaking game, a couple tries to escape from the only world they know; a janitor risks everything to rescue a defective” tank-born baby he can raise as his own. For decades, science fiction has compelled us to imagine futures both inspiring and cautionary. Whether it’s a warning message from a survey ship, a harrowing journey to a new world, or the adventures of well-meaning AI, science fiction feeds the imagination and delivers a lens through which we can better understand ourselves and the world around us. 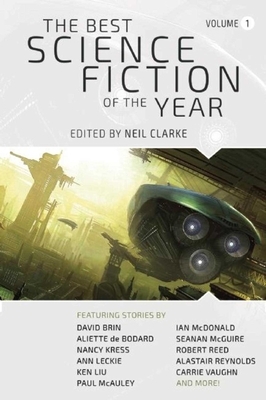 With The Best Science Fiction of the Year Volume One, award-winning editor Neil Clarke provides a year-in-review and thirty-one of the best stories published by both new and established authors in 2015. Neil Clarke is the award-winning publisher and editor in chief of Clarkesworld magazine, winner of three Hugo Awards for Best Semiprozine, and the editor of the 2014 cyborg-themed original anthology Upgraded.